Ambulance services are struggling to reach seriously ill and injured patients quickly enough as the system struggles to cope with demand, a BBC investigation has found. Patients with life-threatening conditions - like cardiac arrests - are meant to be reached in eight minutes. But only one of the UK's 13 ambulance trusts is currently meeting its target. And senior paramedics said the sheer volume of calls meant it was not uncommon to run out of ambulances at times. One of the big problems appears to be the number of crews left queuing outside A&E units waiting for staff to be free to take their patients. 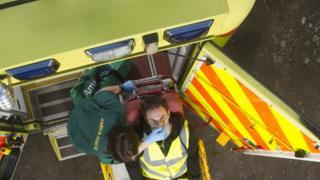 Freedom of information requests by the BBC to ambulance trusts showed over 500,000 hours of ambulance crews' time in England, Wales and Northern Ireland was lost last year - a rise of 52% in two years. This is the equivalent of 286 crews being taken out of the system for a whole year or enough to increase the number of ambulance journeys by 10%. The Welsh ambulance service is the only one that is hitting its targets to respond to life-threatening calls - and that is only after it reduced the number of cases it classed as an emergency from a third to about 5% so it could prioritise the most critical calls. Last week Scotland adopted a similar system to help it cope, while the BBC can reveal services in Northern Ireland and England are also now looking to follow suit. How are 999 calls categorised? It comes after average response times for life-threatening calls topped 10 minutes in Northern Ireland - a rise of nearly three minutes in two years. Figures provided by two trusts in England also showed average times topping eight minutes for the second highest priority calls, including strokes and fits. In the East Midlands patients waited 1 minute 42 seconds longer for a crew to arrive in 2015-16 than they did in 2013-14, while in the East of England the waits were 1 minute 11 seconds longer. College of Paramedics chair Andrew Newton said the situation was of "great concern". "Talking to colleagues around the country, it's not uncommon to find there are no resources to respond at all at a given time, particularly at nights and weekends. I was talking to one colleague recently who was explaining to me that the nearest ambulances were probably in France." Osian Roberts has a unique perspective on the ambulance service. He has been working in Llandudno, Wales, for the past 25 years and is now a team leader - in charge of his son. Mr Roberts believes the job has "changed a great deal" during his career. "When I started over 25 years ago we dealt with life or limb emergencies - but now we're doing more and more calls to patients with chronic illnesses for example, more call-outs, the work we do is so much more diverse." His son Aron, who has been working as an ambulance technician for two years, agrees. He says the work is non-stop. "We can start the shift at 7am - get 10 minutes to check the vehicle then we can be straight out the door. We might not get back until 2pm then get a break of just half an hour. Then it'll be straight out of the door to another call." His father believes the public needs to be educated about how to use the 999 service. "There are other pathways - pharmacy, minor injuries units, GPs and GP out of hours. What we try to say is think wisely before you call an emergency ambulance," Mr Roberts adds. Prof Jonathan Benger, the ambulance lead at NHS England, said delays at hospitals were causing "big problems" for ambulance crews as it meant they were taken out of the system and could not answer 999 calls. But he also said a crucial factor was the increasing number of calls being handled - they hit 9.4m last year, nearly treble the number a decade ago. "In the face of rising demand it is not surprising we are having difficulty meeting these targets. It is time to look at the system," he added. Additional reporting by George Greenwood and Christopher Marchant.